In 2017 we are running a project called “Accessible Bath”. 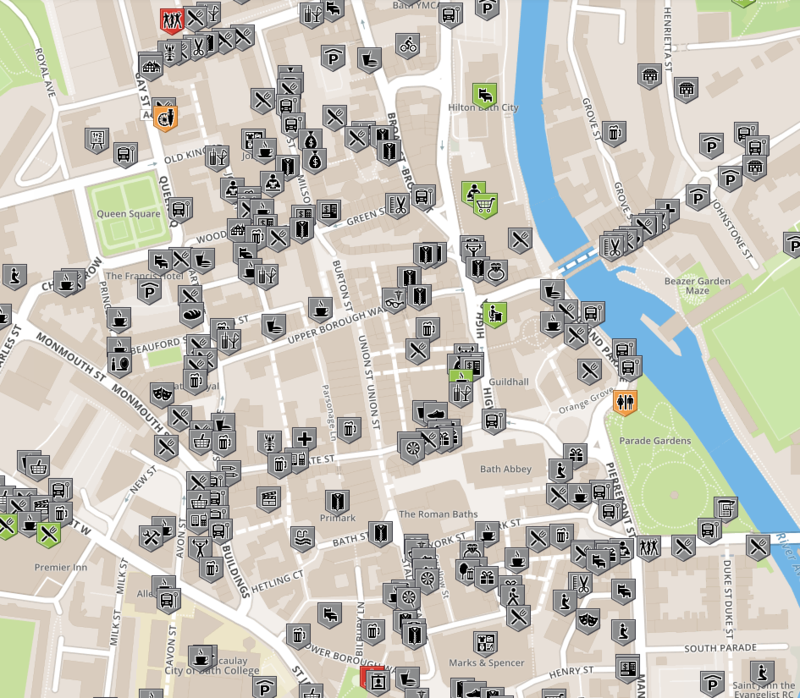 Our goal is to map the accessibility of public locations in the centre of Bath. In this post we explain what we’re hoping to achieve and give you some pointers about how you can help. From an accessibility perspective, Bath is a challenging city. As a heritage city we have a unique architecture that can make life difficult for people in wheelchairs or with mobility issues. Many of these issues have been highlighted in a recent accessibility audit of the cities public spaces. But we don’t have a great picture of which shops, restaurants and other amenities are accessible to wheelchair users. Why are we launching the project? A number of local people have suggested that we should explore accessibility of local spaces. After we were approached by members of the local stroke community keen to collaborate, we held a meeting to learn more about the issues and the types of support that would be useful. You can read more about what we learned. Accessibility issues can vary from person to person. So there is a variety of types of support that might be useful. But an obvious first step was to see if we could collect information about wheelchair accessibility. Especially as the tools for doing the mapping are already provided for us by Wheelmap.org. This means we can focus on working together as a community. Wheelmap is already the world’s largest open, crowd-sourced database of wheelchair accessible places. It makes sense for us to be a part of their project rather than create something new. The service is available in many different languages so can also be easily used by anyone visiting the city. We can also easily extract the data from Wheelmap to use in creating other types of application. We want to build a better picture of wheelchair accessibility in Bath. By the end of October 2017 our goal is to have updated the accessibility status of all locations in the centre of Bath. This will let anyone living in, or visiting the area, to check wheelchair accessibility. Either from home when planning a trip, or when out and about using the Wheelmap mobile applications. The service is completely free to use. Local businesses and venues can also embed the maps into their websites. And at Bath: Hacked we can start to use the data to create better printed maps and mobile applications. We also hope to raise awareness of accessibility issues within the local community. Won’t this make local businesses or locations look bad? No. This is not an exercise in finger-pointing. We just want to raise awareness and develop a better understanding of our local area. Accessibility issues vary from person to person. Just because a location is marked as being inaccessible doesn’t mean that it will be considered off-limits. Similarly, even accessible locations may still present problems for some people. The description of potential accessibility issues is as important as the “traffic light” grading. The accessibility status will help people with disabilities and their carers to make more informed decisions. Knowing that there may be accessibility issues in advance and then being prepared for them, is better than finding out at the last minute. Knowing that, for example, an access ramp is available means a visitor can call ahead. Registering on Wheelmap and starting to contribute to the map. You can do that online or using their mobile applications. Try updating places as you travel about the city. Coming to one or more of our public mapping events and working with others to map the city. We’ll be announcing dates shortly! Helping us to recruit other mappers. the more people we have mapping, the quicker we’ll achieve our goals. We’re using #accessbath as our hashtag for the project. If you want to help us co-ordinate or running any of the mapping events, then please get in touch. What area are we mapping? Eventually we want to cover the whole of B&NES. But to start with we have chosen to start with the centre of Bath. This includes the business improvement district, major attractions and the shopping areas. This gives us a clear goal to work towards and, as the most highly visited local area, the information will have the most impact. Are you planning to map other local areas, e.g. Keynsham or other parts of the city? Yes, definitely. We just want to start with a defined area so we can work together to get a comprehensive overview of a specific local area. But don’t let us stop you adding information about other areas. The more information the better! How do I know how to assess the accessibility of a location? Wheelmap have a handout for mappers that provides some excellent guidance. We’ll be publishing some additional tips shortly, so check back here for more advice. Can I add details about my own business? Right away! Some people have already started updating the map. Jump in as soon as you’re able. Help us make some noise by tweeting with the #accessbath hashtag as you go about your mapping. What if I can’t find a location on the map? Wheelmap uses OpenStreetMap as its database of locations. It’s possible that the location might be missing in their database. If you do find a missing location, then you can add it via the Wheelmap apps. But if you’re unsure, then just get in touch (see below) and we’ll do it for you. Wheelmap also doesn’t automatically show information on all locations. They currently use a list of 300 different types of location. It’s possible that the type of location you want to add might not be included at the moment. Again, if you think this is the case then get in touch. We plan to ask them to include some additional location types. Where can you go to ask more questions? You can also join us on Slack. We have a dedicated channel for this project. Where can we follow for updates and news about the project? We’ll be sharing updates here and our social media channels. Our mapping events will be listed on Meetup. We will also soon be releasing a public progress tracker to help us monitor how close we are to achieving our goal of mapping the whole city. We hope that you’ll be part of the team!